I noticed today a diesel leak from what looks like a round disc (diaphragm) on the front side of the vertical fuel pump. Not sure what this does (some kind of regulation?). Is it common to develop a leak there? I can't see exactly from where the leak is actually coming. Pete what does this look like? I was wondering if it was one of the pumps valves? Are you sure the diesel is not running down to there from a higher place? Jeremy Rowland wrote: Pete what does this look like? I was wondering if it was one of the pumps valves? Are you sure the diesel is not running down to there from a higher place? Good point I shall have to clean it up a bit. I found a photo on the web, not all pumps appear to be fitted with it. This got me intrigued enough to do a bit of googling. 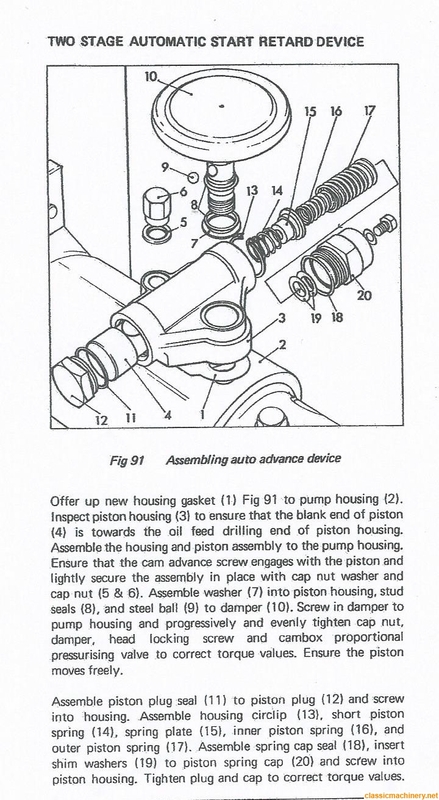 According to http://www.tadiesels.com/fuel_injector_acc.html , this is an "Injection Pump Damper". Okay now I know what we are looking at is it a bad leak or not? Pete I would have thought you would only get this issue fixed by an injection pump specialist? That roumd disk thing is a damper, part of the two stage advance and retard mechanism. The unit avances and retards the injection timing according to engine speed and load , (stage one), and further retards the timing to assist cold starting, (stage two). Some of the early DPA pumps I worked on,( fitted to David Browns), had a manual version opperated by a screw on the advance and retard unit. There is a gasket between the unit and the pump body and four or five other seals / washers all of which I suppose may leak. It's not difficult to replace them and pump overhaul seal kits are readily available for a few quid, (try ebay). Its the same kit for the mechanically governed four and six cylinder pumps. I just dug this out of the manual, it may help? Thank you very much for your reply. It is not a huge amount leaking at the moment but you would not want to spend the night underneath the old girl anyway! I will keep an eye on it now I know what it is. Funnily enough it had not been run for a couple of months at least with the warmish weather yesterday it fired almost instantly. It has done over 15k hrs and I don't think the engine has been touched. Tempting fate but I will change the oil.